With news that Habs GM Marc Bergevin will supposedly start contract talks with P.K. Subban in the next couple weeks, coach Michel Therrien couldn’t have picked a worse time to slide into some of the bad habits that ultimately cost him his job in Pittsburgh; namely using the media to send snarky messages to players. The problem Therrien creates for himself is the disconnect between his public perception of a player and how he actually utilizes that player, and what’s frustrating is knowing all the grief and distraction he generates is easily avoidable and ultimately benefits no one. There’s no gain to be had using the media to embarrass a player, especially with someone not visibly susceptible to the tactic. What it does do is bring to the surface a major concern I and many others had about Michel Therrien being hired in the first place; that temper being his own worst enemy. 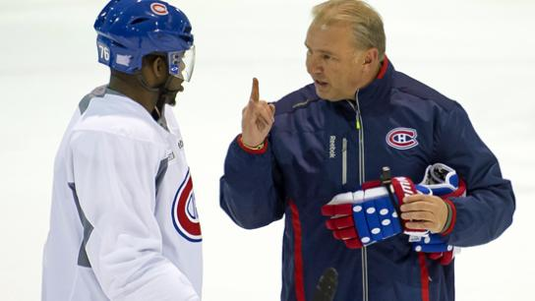 Does Subban even care what Therrien says publicly? It’s impossible to know for certain but Subban clearly has a lot of personal pride and given the hard line Bergevin took demanding a cheap, two year bridge contract, you can be certain Therrien isn’t doing the Habs any favours whatsoever to help dissuade Newport Sports Management from returning the favour with their own hard line approach; demanding a couple one year deals or a two year extension that’ll make P.K. Subban an unrestricted free agent in 2016-17. 35 shifts for a total of 31:43, averaging 54.4 seconds over 16 games. There were three games where Markov got one shift in the last five minutes, and nobody seemed to notice or care. Since being paired with Subban, Markov’s overall game has improved but there has to be concern over how much Therrien’s depending on the soon-to-be 35 year old, currently 10th and trailing Shea Weber for total TOI among defensemen. Nothing good will come from it in the 2nd half of the season if that pace is maintained for 82+ games but so far in the last 5 minutes of games, Markov has been on the ice for six goals scored and one (empty net) against. 29 shifts for a total of 28:52, averaging 59.7 seconds over 16 games. There were five games where Subban got one shift and just one game where he received none. In spite of a recent four game streak (ANA, SJS, NYR and DAL) where Subban only got one shift, he has still managed to log the 2nd most late minutes this season for the Habs. And that zero shift game vs. St. Louis which everyone got worked up over? That was a direct result of Therrien putting him out for a 1:54 shift on a power play that ended with 4:38 to go. In the last 5 minutes of 16 games played, Subban has been on the ice for four goals scored and two (one empty net) against. Making the assumption Therrien's lost trust in Subban, mainly because of that 4 game stretch is a stretch in itself, given only Markov has played more minutes late in games this season but truth is, Therrien only has himself to blame for how badly this story has blown up in the media. He's the one doing all the talking and leaving the door open for others to draw their own conclusions, just as he did in Pittsburgh. 36 shifts for a total of 28:43, averaging 47.9 seconds over 16 games. There were no games where Diaz received less than two shifts. In the last 5 minutes of games, Diaz has been on the ice for one goal scored and none against. Clearly, some of the late shifts Subban hasn’t been getting recently have gone to Diaz but since he hasn’t given up any goals and Subban trails only Markov in late TOI, it’s hard to get overly concerned with 80% of the season still to go. Once we get into the new year, expect to see Emelin shunt Diaz down the list. In the meantime, however, it's starting to look like it's just a matter of time before Bergevin makes a long term contract offer to Diaz. 34 shifts for a total of 27:10, averaging 47.9 seconds over 16 games. There were five games where Bouillon got one shift. In the last 5 minutes of games, Bouillon has been on the ice for no goal scored and none against. Situational shifts as a stop-gap with Emelin out of the lineup, Bouillon hasn’t hurt the Habs late in games... so far. 31 shifts for a total of 24:06, averaging 46.6 seconds over 16 games. There were six games where Gorges got one shift and one game where he received none. In the last five minutes of games, Gorges has been on the ice for two goal scored and one against. You know all that concern over the perceived lack of trust and late minutes for Subban? Well, Gorges is the real concern for me. He should be a solid number three in late minutes on the team missing Emelin and at the very least, should be out there late more than Bouillon. Six shifts for a total of 2:36, averaging 26.0 seconds over six games. There were two games where Tinordi got one shift and two games where he received none. Pretty much what I would expect from a young D getting his feet wet. Look for Tinordi to ultimately play a half season in Montreal or at the very least, be up long enough this season to show Marc Bergevin if he’s ready for a full workload on a Habs D core that’s ripe for major change. Four shifts for a total of 2:08, averaging 32.0 seconds over five games. There were three games where Murray he received none. Early signs suggest Murray won’t be counted on much late in games, which is a good thing for the stop-gap. Three shifts for a total of 1:41, averaging 33.7 seconds over five games. There were three games where Beaulieu got one shift and two games where he received none. Like Tinordi, Beaulieu got limited late shifts and needs to show Bergevin he’s part of the immediate solution between now and next summer. What time they get this season will go a long way towards defining their roles for next season and if the money saved on their cheap contracts can be used elsewhere on the roster with the cap primed for a big jump. What Therrien needs to do is keep teaching his Norris Trophy winner how to improve his game, a process that should never stop and at the very least, take a more neutral position when accessing his performance with the media. Or better yet, with teams lining up to throw a max offer at Subban, either as a pending RFA or as UFA if he deems a two year contract extension to be more than enough, Therrien should balance his comments with how much he actually relies on Subban to win hockey games. Because he does. For the most part, Therrien’s done a good job controlling his temper but those media scrums are really starting to create an unnecessary problem for everyone. If his temper continues to get the better of him with the media, a repeat of his ending in Pittsburgh is on the horizon and it’ll be up to Bergevin to make sure he doesn’t cost them Subban in the process. A mess Bergevin should be able to avoid with one closed-door meeting with his coach, and if that hasn't happened yet, it better be soon.